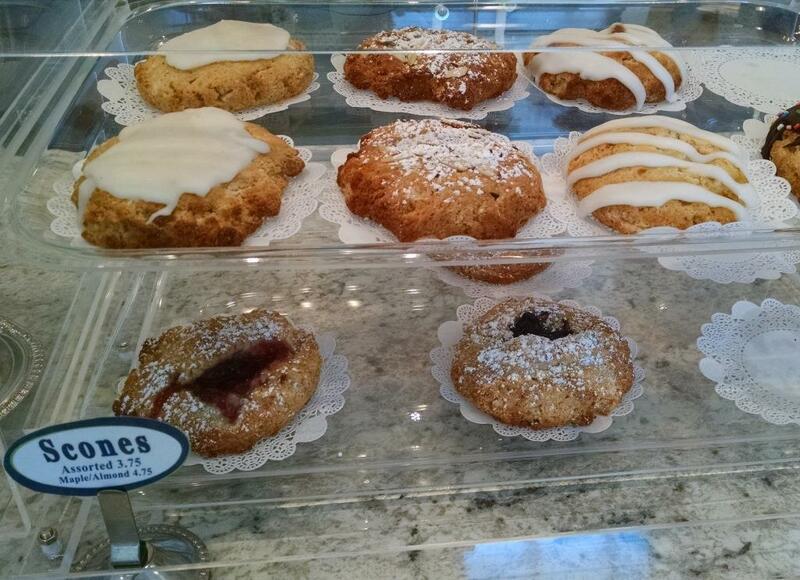 Here’s a round-up of some more of the delicious menu that you’ll find at Cole’s Fine Foods. Don’t mind if the photos don’t exactly match the specific items. I’m a little disorganized at the moment! Trust me, it’s all good. German Chocolate Cupcake: If you love chocolate, these cupcakes will knock your socks off. The cake part of this treat is bursting with chocolate flavor. It’s so good, it doesn’t even need icing. But it gets icing, and man, this icing is smooth, decadent, and delicious. The coconut filling adds just a hint of creamy sweetness to the center. Honestly, cut this guy in half; don’t eat it all at once. Just wonderful. Pesto Pizza: It’s what’s for lunch, or what should be. Wonderful flavor, excellent consistency, and one of the great pleasures of eating this pizza is the amazing aroma that fills your senses before each bite. And it tastes exactly how it smells – which isn’t always the case with food. Dairy-free Lemon Bars: Yes, the orgasmic lemon bar now has a dairy-free sibling, and without putting them in a taste-test side-by-side, I couldn’t tell the difference. So all you non-dairy folks, get on over to Cole’s and enjoy one of those. Cole’s now also has even more vegetarian offerings, and an awesome new take-out freezer where you can buy prepared pizza, desserts, pie crusts, and more, and cook them up in your own house. Personally, I’ll leave the cooking to the talented Jeanine, but either way, you’ll always find something excellent at Cole’s. Have you ever eaten something that tasted so good that you did not want to eat anything else for hours afterwards so you could keep that taste in your mouth? 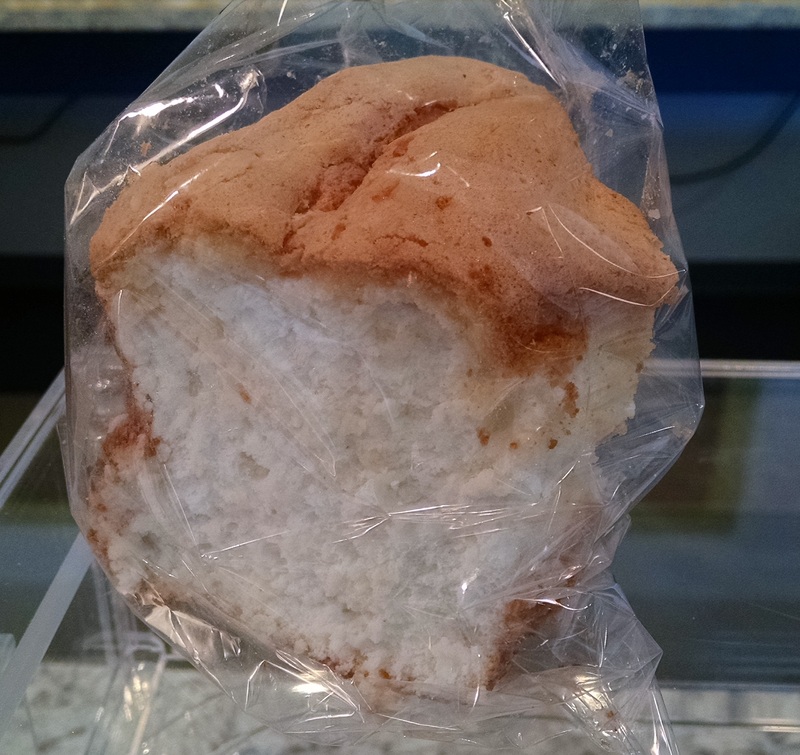 That is how good the gluten-free angel food cake is at Cole’s Fine Foods. In fact, while I was there, a man who is not gluten-free came in to buy one for a cookout because he said it was better then regular angel food cake. Can’t get there to buy your own cake? 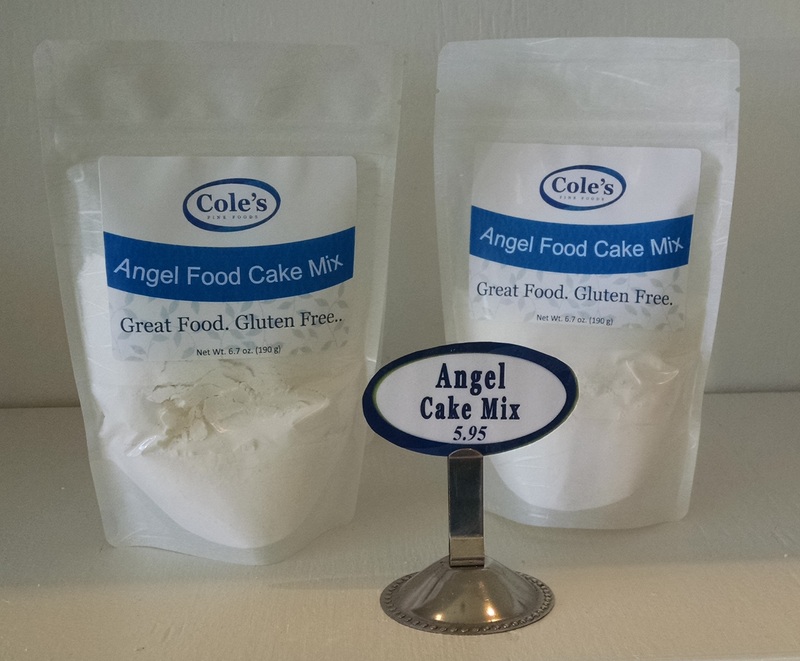 Get their angel food cake mix and you can make it at home whenever you want. I have two favorite food places in the world: Lou’s Café on West 52nd Street in New York City, and White Box Pies Bakery and Café in Spokane, Washington. What constitutes a favorite food place? Quality of food, knowledge-level and courteousness of the staff, cleanliness and price should all be considerations. But a favorite food place, just as any favorite anything, should give a person a feeling of comfort and pleasure. Both restaurants provide those. However, White Box also provides gluten-free meals and desserts. Only a person with food allergies can fully appreciate feeling “safe” in an eatery. White Box is one of those safe places; everyone on staff knows about gluten. You won’t find a couple of uninformed, not to mention uncaring, teeny-boppers behind the counter huffing at you when you ask for gluten-free. The staff at White Box is always happy to answer any questions about their creations. Take feeling safe and add to it amazingly delicious desserts, many of which non-allergic people did not realize were gluten-free, and you’ve got a winning combination. Cream pies, sugar cookies, brownies, pineapple coconut cake, cheesecakes, chocolate pecan cake, hazelnut cake, cream puffs…and the list goes on. They are all heavenly. But that’s not all! White Box also features gluten-free sandwiches, soups, salads, quiches, and my favorite: pot pies. You can eat in or take out, and all these foods are reasonably priced. Not only is the staff at White Box knowledgeable about gluten-free foods, they are friendly, courteous and all around nice. It’s a small, family-run business and you can tell they take pride in everything they do. The ambiance is bright and cheery, with the hum of satisfied patrons at their café-style tables. And their bathrooms are super clean, too. Not a Celiac? Don’t worry, there are plenty of goodies at White Box for you as well. Pretty much everything they make gluten-free is also available for wheat-eaters. To top it off, their foods travel and store well. I am always freezing their cakes and slicing off bits and pieces for snacks or dessert. The only problem with White Box Bakery and Café foods is that they are so good, that I usually take a bite out of them before I can get a photo. When I ate lunch there last week, I did it again; I dove right into the bacon broccoli cheddar quiche without thinking! And it was during that lunch last Wednesday that I sat at a table in the Café, savoring the piping hot piece of quiche, that the feeling of safety, comfort and pleasure came over me. I realized I was in a favorite food place. White Box Bakery and Café is truly one in a million. Try it out and see if it doesn’t become one of your favorite food places, too. 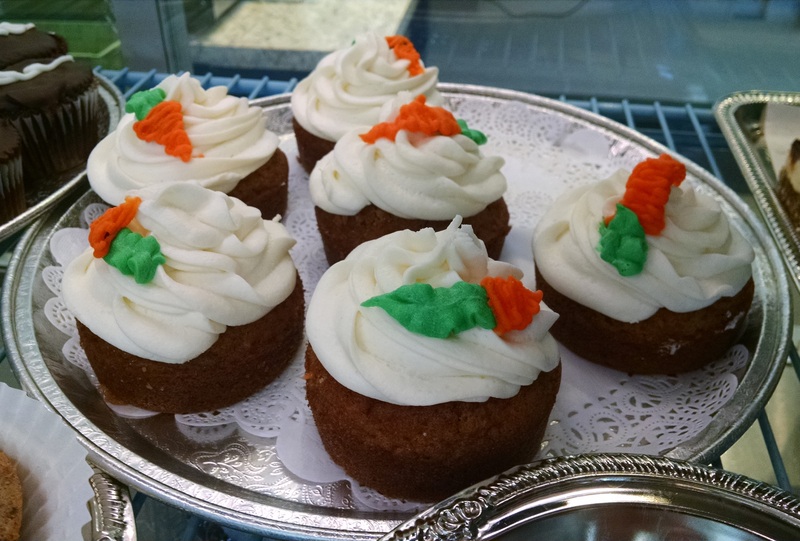 You can find them at the corner of East Sharp Avenue and Ruby, Spokane, Washington, or on the web at http://www.whiteboxpiesbakery.com. Check their site for coupons and specials.